At some time between 656 and 705 A.D. Hubert was born in the city of Maastricht. The oldest son of Bertrand, Duke of Aquitaine and grandson of Charibert, King of Toulouse, it's safe to say he enjoyed a life of leisure, nobility and of course the hunt. A wealthy aristocrat, Hubert was reputed to be a lover of pleasure. His passion was the chase of mounted hunting, to which he devoted nearly all his time. 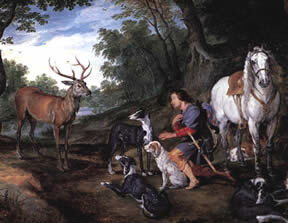 According to legend, Hubert was afield on the morning of Good Friday and he was participating in the chase of a deer on horseback with his hounds. As he was pursuing this more than healthy stag through the Forest Ardennes he reached a clearing in the wood; the animal stopped and turned. Hubert was astounded at perceiving a crucifix suspended between its antlers, he heard a voice from the figure of Christ say, "Hubert, unless you turn to the Lord, and lead a holy life, you shall quickly fall into the abyss of Hell!". Hubert dismounted immediately from his horse, knelt to the ground and asked, "Lord, what would you have me do?" He immediately received the reply, "Go seek Lambert and he will instruct you." Lambert was the Bishop of Maastricht, who took Hubert in and became his spiritual advisor. Sadly, Hubert lost his wife during the childbirth of their first son shortly after his vision in the woods. As a result of the vision, the grief, the advice being given, Hubert relinquished his birthright as heir to the Duchy of Aquintaine, giving it to his younger brother Eudon, whom he also made the godfather of his infant son, Floribert. He also decided to renounce all his honors, military rank and his beloved hunt to become a Bishop himself. Hubert died at Fura (the modern city of Tervueren) in the province of Brabant on May 30, 727 A.D.
St Hubert Day, November 3rd, is celebrated as the beginning of hunt season in many parts of Europe with a traditional stag hunt inclusive of a blessing of the hounds along with a giving of bread to them in the remembrance of the belief that this will stave off rabies (one of St Hubert’s miracles), a sharing of wine among riders and a post hunt meal of game meats is traditional. According to the Masters of Foxhounds Association of America, Englishman Robert Brooke was the first man to import hunting hounds to America, bringing his pack to Maryland in 1650 when he imported his horses and a pack of foxhounds. The first organized hunt for the benefit of a group (rather than a single patron) was started by Thomas, sixth Lord Fairfax in 1747. In the United States, George Washington and Thomas Jefferson both kept packs of fox hounds before and after the American Revolutionary War. 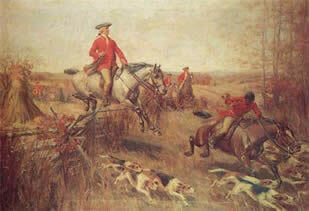 In the US (and in Oklahoma), fox hunting is also called 'fox chasing,' as the purpose is not to actually kill the animal but to enjoy the thrill of the chase. A hunt may go without a kill for several years, despite chasing two or more foxes or coyotes in a single day's hunting. As a rule, quarry is not pursued once they have 'gone to ground.' American fox hunters and Harvard Fox Hounds undertake stewardship of the land, and endeavor to maintain fox and coyote populations and their habitats as much as possible. E. W. Marland is credited to bringing the sports of polo and fox hunting to Oklahoma. Coming to Oklahoma broke after the crash of the 1929 stock market; Mr. Marland reestablished his wealth in the oil business that began its boom in the early 1930s. He then brought red foxes to be kept, bred and hunted to Oklahoma from Pennsylvania. The many non-indigenous red foxes now living in this region are descendants of “Marland” foxes that escaped from his care. Launching from either the Marland Mansion in Ponca City, Oklahoma or from his "101 Ranch", Marland was an avid hunter. Often seen dressed in hunting attire, he hired a Master of the Hounds to direct the local hunters in the proper way to conduct themselves during a fox hunt. To become part of the activities became “elite” thing to do in Ponca City during his tenure and beyond.